If there is one trend in interior design that has gained a lot of traction in recent years, it's been the use of open furnishings and those that add and create the illusion of more space. This is especially handy in the bathroom, where your furnishings see a lot of action on a daily basis. 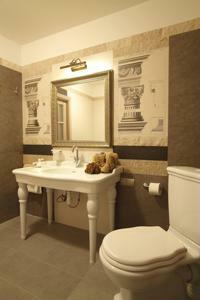 As the focal point of your washroom, your vanity sets the decorative scheme for the rest of your room. Better Homes and Gardens recommends an open style that offers exposed shelving and a refreshingly modern look. Here are a few ways to pull off the look in your home. 1. Frosted glass. If you need a large amount of space and don't want to feel overwhelmed by the amount of stuff you have in the room, the news source suggests linen cabinets with frosted glass. This will give you plenty of space for toiletries and linens, and will help the room feel more spacious and bright. 2. Stacked linens. Without the benefit of a full-scale linen closet, you may not have enough space to accommodate an additional cabinet in the bathroom. Instead, use your vanity as a fixture in the room's design by stacking up towels underneath the sink. This will improve the utiliy of the space and provide a surprisingly touch of color that will boost your interior design. 3. Decorative containers. While baskets have held sway in the bathroom for years, there's no need to hold back your imagination when thinking of methods to hold small items in your washroom. According to HGTV, one way to add your personality to the room is to decorate a few mason jars and display them on the shelf. However, if you're not interested in the repurposed look, keep your eyes peeled for a few antique tea jars, glass decanters or other more opulent pieces that can improve the appeal of your vanity shelves. These are ideal for small toiletries like soaps and bath gels, as well as everyday products like cotton balls and hair clips. Whether you're remodeling your bathroom or trying to simply trying to de-clutter it can feel like there's never enough storage. An open bathroom vanity can help you to streamline the room's appeal and give you plenty of flexibility. What decorative tips do you have for homeowners with these open furnishings?